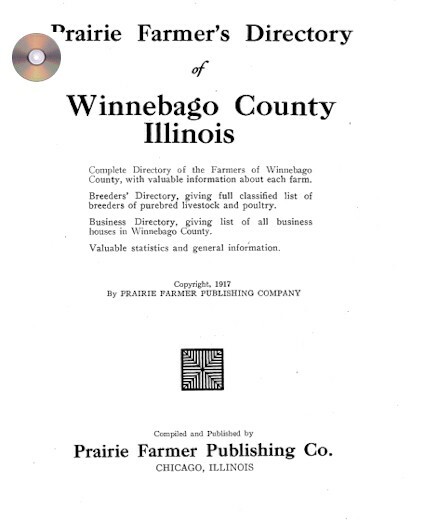 Originally published Prairie Farmer Publishing Company, Chicago IL, 1917, 170 pp. This is a reproduction on CD. Farmers Directory - This contains the name of farmer, spouse with her maiden name, name of children, how many acres farmed, owns or rents the land and the year farmer moved to the county. Often this is the year the farmer was born. Breeders Directory - in order by type of livestock. Business Directory - for each small town. 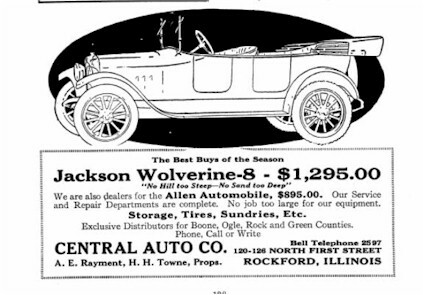 Automobile Owner's Directory - Find if your ancestor was a Ford, Maxwell, Overland or Studebaker fan. Tractor Owner's Directory - was it a Case, Heider or maybe a Hart-Parr? Winnebago county is in north central Illinois and is surrounded by Boone, Ogle & Stephenson counties. The county seat is Rockford. Other towns include Cherry Valley, Durand, New Milford, Pecatonica, Rocton, Roscoe, Seward, Winnebago. About the CD: This CD provides the genealogist the opportunity to have access to information from a book that is difficult to locate in the used book market. The CD was made by scanning an original copy of the book. Any defect such as notes in the margin or light text will also appear in the CD version. The CD requires Adobe Acrobat Reader to view the file, the latest Windows version is included with the CD. The Mac & Window readers can also be downloaded from the Adobe website. The information on the CD can either be printed out and read in the traditional manner or viewed with your computer. When viewing on your screen the page size can be increased to make reading easier.The second scan on the right is at 200%. This CD is searchable and has a series of bookmarks making navigation through the file easier. The CD is packaged in a projective sleeve.